Charlie, who was born on Dec. 14, 1932, died in 1995. 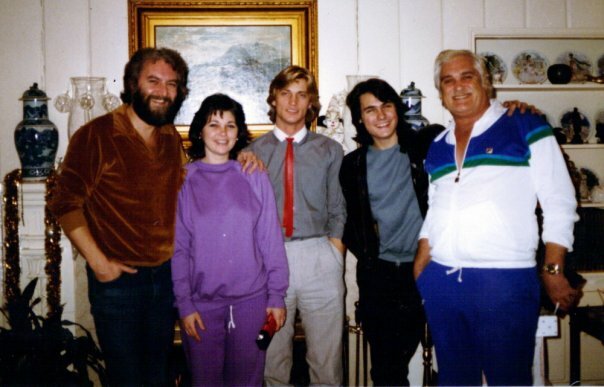 The photo was taken in the living room of his Memphis home circa 1984 with Charlie on the far right, me on the left, my then wife Renée Rich, her brother-in-law, musician Keith A Lee, and Renee’s brother Jack. Of this group, only Keith and I survive. Renée died at Christmas 2006, and Jack died in 2008. Charlie Rich was a walking contradiction. When he spoke, the sound was of crushed gravel. When he sang, his voice moved Bob Dylan, among others, to call him the best ballad singer ever. Rich was a big man, handsome and imposing, but he was painfully shy and reluctant to embrace the worldwide acclaim that showered wealth and fame upon him in the ‘70s after 20 years of being the unsung musician’s musician. He was a devoted family man, married to songwriter Margaret Ann Rich for more than 40 years [she died July 22, 2010) and the father of four children (and, for a time, my father-in-law), but his reputation was that of a hard-drinking loner. He died peacefully in his sleep on July 25, 1995, at age 62, of a blood clot in his lung in a Hammond, La., motel with his wife beside him. He’d spent the weekend with his family. He hadn’t had a drink in years and had seldom looked better. Arkansas-born, he grew up with a hard-scrabble sharecropper’s view of the world with Mississippi Delta blues in his veins, and yet he won success in the world of country music. All he ever wanted to do was sit at the piano and with his huge hands moving elegantly but authoritatively above the keyboard, play the sorrowful blues and jazz tunes that moved him, but he responded gratefully when audiences clamored to hear his biggest hit, “Behind Closed Doors”. In 1973, the song earned him a Grammy for Best Country Vocal Performance, Male. In 1974, he was named Entertainer of the Year by the Country Music Association (CMA). The following year, he appeared on the awards show to announce his successor. Opening the envelope, he read the name John Denver and, pulling out his Zippo lighter, set fire to the card. Many in the worldwide audience roared their applause, but the Nashville community was outraged and had little to do with him after that. Only three artists have ever won back-to-back CMA Best Album of the Year Awards [at time of writing]: Johnny Cash, Garth Brooks and Charlie Rich. And yet, in his later years, Rich was never happier than on Tuesday nights in the recording studio at his Memphis home when some of the best session men in town joined him for nights of transcendently sublime jazz and blues. Some of that is reflected in his 1992 Sire Records album, “Pictures and Paintings”, but the voluminous tapes of those private sessions contain the essence of what made Charlie Rich unique in country music. Rich never made happy music – he hated it – and what sets him apart from every other country singer is that he never whined in his songs. The best song he ever wrote was “Feel Like Going Home”, which has been recorded by innumerable artists and featured in many films and TV shows. It displayed the unvarnished honesty that he brought to his life, and to his music. “I tried and I failed, and I feel like going home”, is the way it goes. Anyone who’s ever heard it knows what that means, and is glad that Charlie never failed and accepts that he is safe home. This entry was posted in Memory Lane, Music, Recalling ... and tagged Charlie Rich, Keith A Lee, Margaret Ann Rich, Renee Rich, Sam Phillips. Bookmark the permalink.